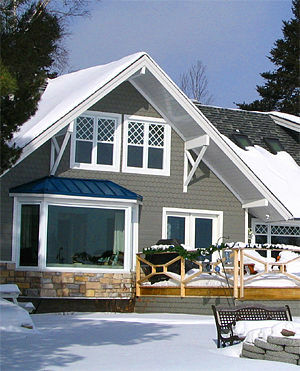 We manufacture a complete line of standardized products such as cove and ranch channel siding, exterior v-joint, Boston style, rabbeted bevel and more. In terms of colours, the customer has the choice of several thousand shades be it in solid, 100% acrylic latex or semi-transparent. V-joint 3 - 6 " in width, and other custom patterns, wood for sauna manufacturing, etc. We offer a range of regular and colonial door and window casings, baseboard mouldings, quarter round, chair rail, O' Gee, etc. We will make mouldings to your own specifications. Porch flooring, gazebo, cedar mulch, etc. Yes, we invite you to buy directly from us. 95% of our production is sold to customers who are doing their large or small project. And we are selling to contractors hired by you. This is how you can take advantage of factory prices. Éco-Cèdre inc guarantees the finish from the date of purchase for a period of 10 years. Will not peel or blister from the prefinished surfaces. Will not erode to expose the wood. The stain touchups has to be made with the stain supplied with the original order. Éco-Cèdre inc cannot guarantee the exact tint for touchups following a second order. Éco-Cèdre inc guarantees that, for the first three years following the original order date, the original buyer will get a sufficient quantity of stain and labour needed to restain the damaged surfaces under the warranty. The maximum amount allowed for the labor needed to restain is $1.00 per square foot. During the following seven years of the warranty, Éco-Cèdre inc, at it's sole discretion, will furnish only a sufficient quantity of stain needed to restain the damaged surfaces under the warranty. The touchup differences of colour are not guaranteed. A permanent contact with water or ground will void the warranty. The change of colour caused by exposition to UV rays and weather are not covered by this warranty. Natural phenomenon, like cracking, resin seepage, buckling, shrinking and knot bleeding are not covered by the warranty. 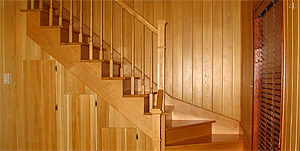 Planks with apparent defects are not covered by the warranty if they are installed. The use of a high pressure washer to clean the siding will void any warranty. Growing of surface spores, molds or mushrooms are not covered by the warranty. These stains are conceived to let the wood structure be seen and permit a variation of tints. The semi-transparent stains do not contain the elements needed to get the prolonged durability of the solid color stains. So, no warranty is offered for the semi-transparent stains.